When to Use Curved Barbells? 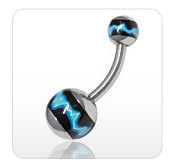 Curved barbells are among the most popular body jewelry styles. They are also some of the most beautiful and richly ornamented piercing jewelry pieces you can use. Shiny curved barbells with numerous decorations are typically used for navel piercings but you may also use them for many other piercing types. They are ideal for special occasions when you want to look your best. The main curved barbell design is relatively simple: the barbell consists of a shaft and one bead on the each end. The shaft can be curved in several ways. Typically, it is a gentle curve but another common design is a curve on the end of the barbell, which makes the barbell resemble the letter J. 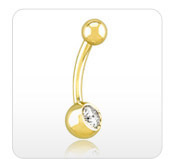 These curved barbells are known as banana barbells and are typically used for navel piercings. Curved barbells often include rich decorations, such as top and bottom gems, dangles, chains and even smaller gems on the dangles. There are also various charms and other decorative elements that can be attached to curved barbells.